Paris 10th April, 2019. Government of Pakistan is taking a number of concrete steps to ensure provision of quality education to all school going children with special focus on enrolment of girls in the schools in pursuance of UNESCO’s objectives. 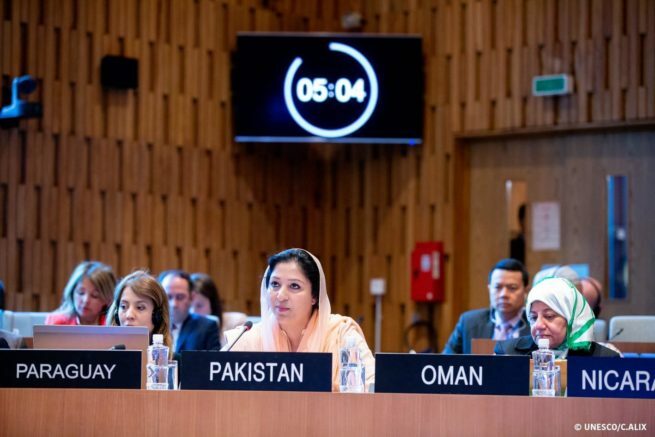 This was stated by Ms. Wajiha Akram, Parliamentary Secretary for Education and Professional Training and the newly appointed Pakistan’s Representative to UNESCO Executive Board while delivering country statement at the ongoing 206th session of UNESCO Executive Board meeting at UNESCO’s headquarter in Paris yesterday. The Ambassador of Pakistan to France and Permanent Representative of Pakistan to UNESCO also attended the meeting. Ms. Wajiha Akram said that women in Pakistan had always been at the forefront in all national and international discourses and her appointment reflected the importance that we attach to the empowerment of women in Pakistan. She said that Malala Fund for girls education established in UNESCO by humble contribution of US$ 10 million from Pakistan was bringing change in the lives of thousands of girls in Pakistan and many other countries in Asia and Africa. Ms. Wajiha informed that members of Executive Board that incumbent government of Pakistan has a new vision to make Pakistan a peaceful, prosperous and developed nation. Government’s reform agenda was based on good governance, economic revival, poverty alleviation, human development, preservation of cultural heritage and protection of environment. She said that many parts of the world were still facing conflicts that affect global peace and harmony, endanger our cultural heritage and threaten our environment. It was the shared responsibility of all UNESCO members to strive to work together to strengthen UNESCO to foster better understanding for global peace and stability.